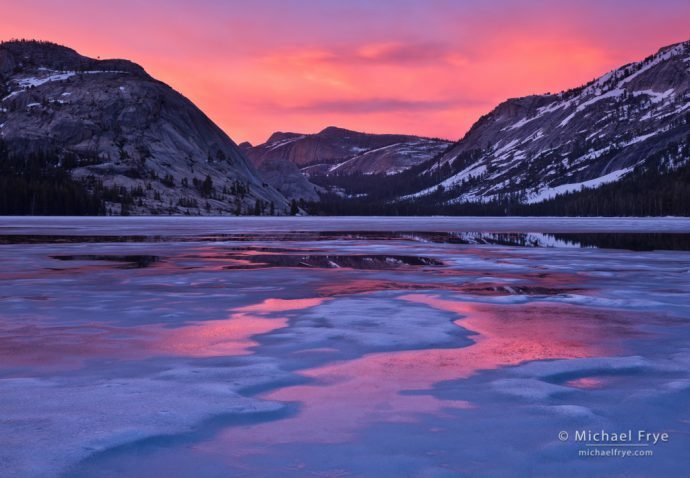 Sunset at Tenaya Lake, Yosemite. I had to work quickly to find a foreground design to go with this colorful sunset. I’ve always been attracted to color. Color can be eye-catching, but more importantly to me, it’s a powerful tool for conveying a mood. My attention is easily caught by colorful subjects like flowers, fall leaves, sunrise or sunset clouds, reflections, and so on. The colors don’t have to be bold; a subtle color palette can be just as compelling. But while interesting colors always catch my eye, I know that color is not enough by itself. You can’t just point your camera toward something colorful and expect to make a great photograph. A frame filled with a random mishmash of autumn leaves won’t be compelling – it’ll just be a colorful mess. You need to find a design to go with that color. So I’m always looking for focal points and patterns that could help give structure to the color. 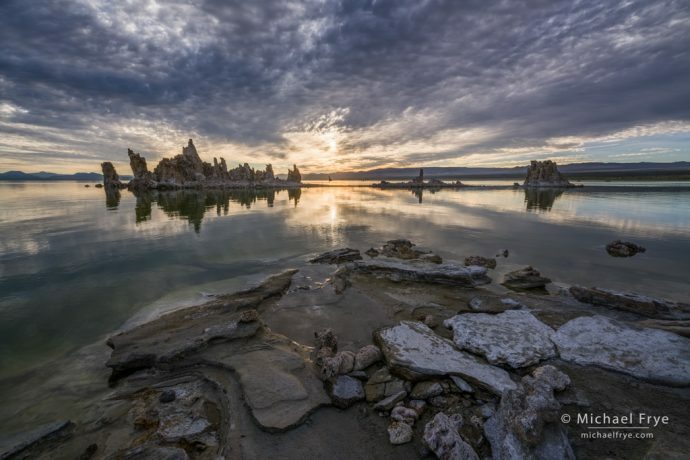 A: Morning light and clouds, Mono Lake. Can you guess what kind of lens I used for this photograph? When I post a photograph, people often ask me which lens I used. I’m happy to tell them, but I don’t think you learn much when someone hands you an answer. I think it’s more instructive to try to guess yourself. Estimating what lens focal length a photographer used can help train your eye to see the world the way the camera sees, and learn how lenses control the sense of depth and perspective in a photograph. And those things will help you find compositions more readily, and make it easier to choose which lens to use in the field. 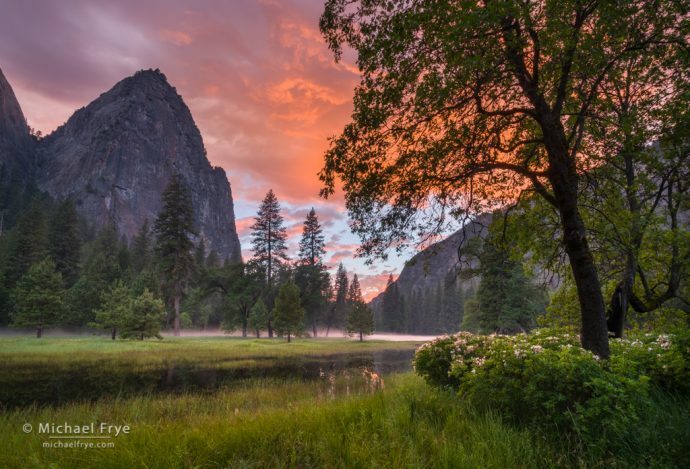 Wide-angle lenses often create a sense of depth, and immerse you into the landscape, while telephoto lenses flatten the perspective and isolate small parts of a scene. Telephotos are also great for creating patterns. Those traits aren’t always apparent, however, nor are they exclusive. You can show patterns with wide-angle lenses, and you can convey a sense of depth with telephoto lenses. And you can photograph intimate landscapes with wide-angle lenses, and show a vast, sweeping landscape with a telephoto. Before our recent redwoods workshop Claudia and I drove inland, toward the higher elevations of Redwoods National Park, and found a beautiful, dense patch of lupines in one of the “prairies,” as they call them in that part of California – an open, grassy area amid the dense surrounding forests. We also found some photographer friends there, Terry Donnelly and Mary Liz Austin, and met two other photographers, Ed Callaert and Bruce Jackson. It’s amazing how you meet photographers in the most out-of-the-way – yet beautiful – places. On that first afternoon the light wasn’t particularly special, but I did manage to make one image I liked (the first one below) in soft light after the sun set. Two days later, in Crescent City, we woke early and saw a high fog bank, or marine layer, and thought maybe we might see fog among the lupines. 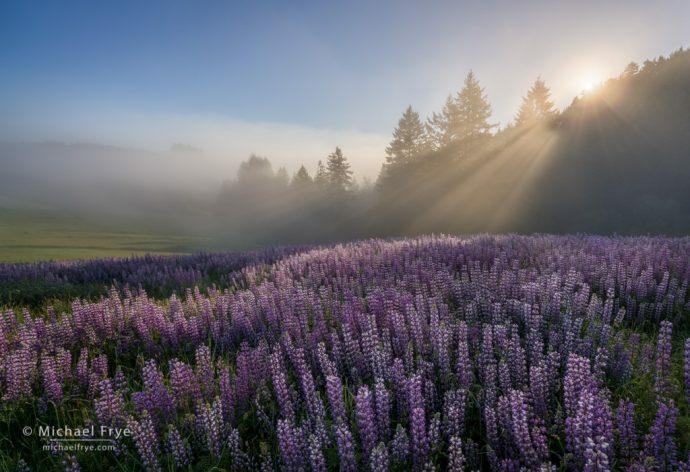 Claudia and I arrived about 15 minutes before sunrise, and the lupines were right at the top of the fog bank, which was perfect, creating an opportunity to photograph sun, fog, and lupines together. Last Sunday, after the double rainbow from Tunnel View faded, Claudia and I headed down to El Capitan Meadow. We had explored this meadow earlier in the afternoon and found azaleas still blooming (though most were past peak). I hoped to photograph the azaleas again in better light, maybe with a sunset above. By the time we got to El Cap Meadow the sky was already starting to get interesting, so I had to hurry. My previous explorations gave me a head start, but I still had trouble finding a good composition that included azaleas, the sky, and, preferably, Lower Cathedral Rock. There was also some mist along the Merced River in the distance, and ponds reflecting the sunset, so I wanted to include those elements too, if possible. 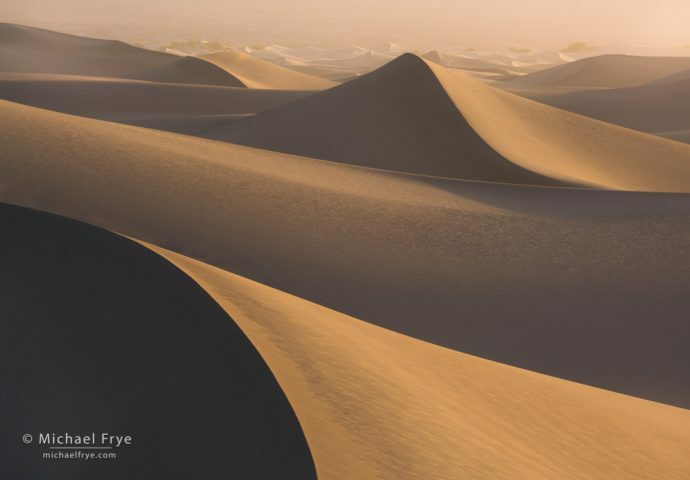 I love the sand dunes in Death Valley. As I wrote in this recent post, they’re like a giant visual playground, with lines, curves, patterns, and textures everywhere. But there’s more to Death Valley than dunes. It’s a big place (the largest national park in the lower 48 states), and it takes time to explore this vast area, but photogenic landscapes abound. 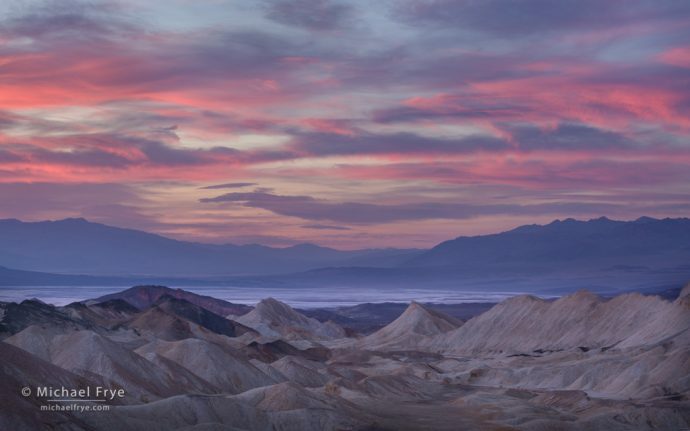 One of the most striking features of Death Valley is the lack of vegetation. 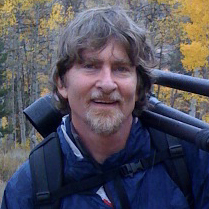 Now don’t get me wrong – Death Valley has a wonderful and diverse array of plants. Some years bring great flower displays, and you can even find limber pines and bristlecone pines at the highest elevations. But there are also vast areas of naked earth. In the badlands, or out on the salt flats, you can see large swaths of ground with scarcely a shrub or blade of grass. 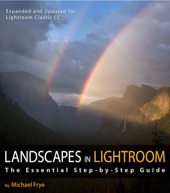 This is landscape photography at it’s most elemental, with only bare earth and sky as subjects. You can concentrate on the patterns, textures, forms, and colors of the rocks and minerals themselves, unobscured by vegetation.